I’ve been talking about unschooling since my oldest wasn’t even 2 years old. That’s awesome, and all, but it was really just theory then. But now…my oldest kids are 9.5 and 8. If we did “grades,” they’d be going into 4th and 3rd right now. Things are a wee bit different now than they were several years ago. Some people may be wondering…do we still unschool? What does that mean, now? What does it look like? I’ll share with you what’s going on for us, now, and what “unschooling” really means as kids get older. Obviously, these are just our experiences and different families will do things in a different ways. But at least you can get a feel for what one family does. 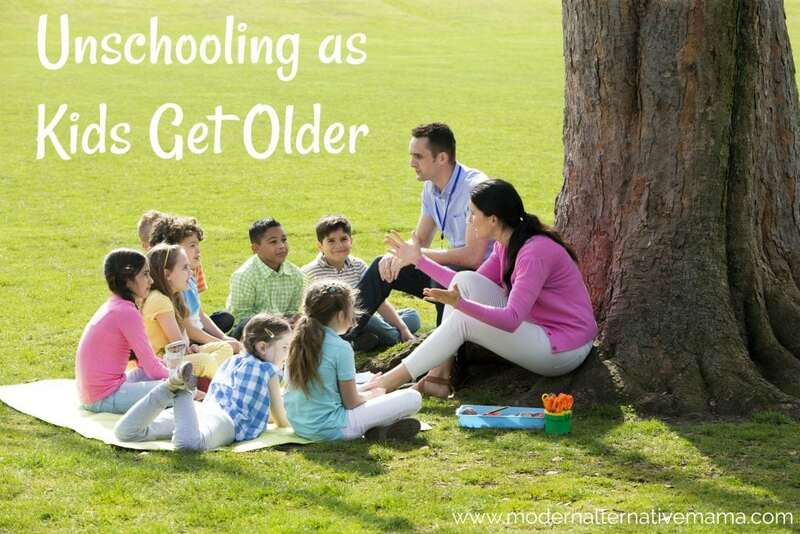 There’s this idea that you can’t unschool as kids get older. That’s usually born out of a mistaken idea of what unschooling is, though. A lot of people think that unschooling means no parental involvement…no classes…no textbooks or worksheets of any kind. But it really isn’t that at all. What unschooling really means is parents working closely with kids, guiding them, and helping them achieve their goals. This may include classes, textbooks, workbooks, or whatever else the student wants or needs to achieve those goals. Using these tools becomes more common as students get older, too, and sit down to learn specific subjects. True unschooling — unschooling done well — can absolutely be done at any age. Adults do it, too! If you decide you want to learn a new skill (say, quilting, woodworking, graphic design, etc.) and you seek out tutorials, projects, or classes — you are “unschooling” yourself! In general, that’s where are right now. The kids let us know what goals they have…and we help them work towards those. What If They Just Never Want to Learn ________? It has been our experience, so far, that this simply doesn’t happen. Some kids are just not interested or ready for certain subjects at certain times. A child may teach themselves to read at 4 – 5 years old; or they may wait until 8 – 9 years old. I’ve found that if they are resisting, no amount of prodding and practicing will “make” them learn. We tried this with my oldest at age 6, doing sight words nightly for months to teach her to read. She cooperated for this, she “wanted” to, but was not ready and quickly forgot most. Then, at 9, she decided she was ready (although she’s shown signs of dyslexia, which may explain why she waited so long) and she progressed from reading basic words to reading at a second-grade level in a matter of weeks. She’s now always reading my messages or what I’m reading over my shoulder, and regularly asks me to write out recipes for her to cook from. When she was ready…it did not take long at all. Sometimes, it just requires a little more patience, and an understanding that not all kids get to the same level in every subject at the same time. But unless there’s something going on, they will get there. Sometimes, kids are just frustrated because the teaching method or the materials available to them don’t make sense! Several of our friends’ kids have been diagnosed with dyslexia, so standard learn-to-read materials do not work for them. Obviously, if something does not make sense, they will get frustrated and not want to do it at all. The real reason may be that they just need another approach, another method, something that makes more sense to them. Keep looking for it and work with them to find something. By the way, that “something” that works for them can be completely non-traditional. My kids have learned to read mostly from just…reading books (surprise!) but have learned to read and spell more words by writing recipes, playing board games, and playing the old game Space Quest (which is a text-based video game where you have to type in commands). Get creative. I’ve found it’s all in how I phrase it. “Let’s do some science,” is met with groans and “I don’t like science!” but when I say things like “Let’s raise caterpillars…let’s raise tadpoles…let’s grow these crystals…let’s watch the eclipse…” (and so on) they are all about it. They don’t associate it with ‘science’ for some reason, even though it is. The point is, maybe a kid doesn’t like a “subject” but there is probably some project or approach to it that would intrigue him or her. I think this is true for a lot of kids who used to go to public school (although mine haven’t). They associate certain subjects with learning a specific way, and they don’t like that way. Finding a different approach, especially a story-based or hands-on approach is going to yield much different results than just pushing a subject. A related complaint is that unschooled children will not just discover topics on their own. That is, if no one exposes them to an idea or concept, they won’t know it exists to ask about it. That much is true. That’s why a good unschooling parent will purposely expose their children to different ideas, via books, field trips, videos, projects, etc. If it “sticks” and the child is interested…awesome. If not…that’s okay too. At least they know it’s out there. My kids watch a lot of “learning videos” (mostly TedX talks, although there are other channels they watch, and a few specific shows too) that cover a wide range of topics. Some they latch onto, and some they don’t. My 9-year-old has taken an interest in Greek mythology thanks to these. In unschooling, there are no grades and no grade levels. There is no arbitrary time line of when kids need to know certain information. Now, the kids aren’t always behind grade level, either. Each has their own strengths and weaknesses. One of my kids would be considered 2 – 3 years ahead in math right now. Most kids are “ahead” in some areas and “behind” in others, and this has certainly been true for us. See 8 Responses to People Who Question Unschooling. This one makes me laugh…all the time. Personally, we’ve participated in coops for the last three school years (since my oldest hit first grade), and will be doing another this fall. I know, I said I was done with coops…and then happened into this one, kind of by accident. It’s actually pretty cool. The short version of the story is, a few of us who are friends and whose kids get along well got to talking, about maybe doing something more informal and small. One kid had had a desire to be involved in theater for awhile and put on a play…and the other kids caught on to the desire and asked to do it, too. So, the coop was born. This year, they’ll be doing their own play — writing it, directing it, acting in it, doing costume design, set building, props, lights, sound, and more. Weekly coops have given us a chance to get out and meet lots of people, and for the kids to develop friendships. We’ve also done play dates, field trips, church groups, and more. The kids probably know fewer people than if they went to school (at least…fewer people their exact age), but they have many good friends and more time to invest in friendships they care about. They’re also quite confident around people of all ages. My 8-year-old had the opportunity to take a week-long trip with my parents this summer. He traveled all along the East Coast with them, going on boat tours, seeing historical sites, meeting extended family members, and more. He was quite confident and eager to talk to everyone he met. That’s the beauty of homeschooling! Unschooled kids have different social opportunities than public schooled kids do, but they certainly have plenty of them! But It Doesn’t Look or Feel Like School! A lot of people have a hard time wrapping their minds around this. Unschooling feels like it doesn’t have enough discipline, like kids will never learn that there are things they just “have” to do, this isn’t above or beyond what any “good” parent would do, etc. It is a hard thing, when you’ve been taught that “learning” means “school.” Desks, teachers, worksheets, and textbook. But learning does not have to look that way…and that does not always mean learning! What we have found is that until around 8 – 9 years old (roughly) most kids just want to play and do simple projects. They are still just exploring the world. But somewhere around that 8 – 9 year mark, the kids start needing and wanting more. They start coming up with specific goals they’d like to achieve. Sometimes these are overarching goals (my 9-year-old would like to own a bakery someday), and sometimes they are more specific (such as reading a certain number of books within a certain time frame). When the goals are specific, then we just support them in achieving them — taking them to the library, setting aside time to read together, etc. When the goals are more vague, then we look at what smaller goals we need to make to accomplish the big goal. Running a business requires strong reading and writing skills, solid basic math skills, saving up money to buy supplies, and more. Since we’re talking about a bakery, cake decorating is a key skill too. It’s been our experience that once they latch onto something they really love, that they stick to that and want to do whatever they can to work towards that ultimate goal — even if all the little things along the way are not necessarily their favorite. They’re willing to do those things because the long-term reward is worth it! That’s how unschooling at older ages works, really. They develop ultimate goals of what they want to do with their lives, and we help them to get there. I can’t tell you how it will work out in the end, because of course they’re not grown yet. But we’re several months (at least) into their long-term goals and they’ve been quite consistent in wanting the same thing, so we’re helping them learn and work towards it! A lot of what we choose is free. We also maintain an Amazon wishlist so that we can buy items when we have the money, or for birthday or Christmas. Grandparents also have access to this list so they can buy things as gifts. We don’t get overly complicated. We don’t buy a lot of manipulatives or educational “games” or things. It’s just that we don’t really need them! It is easier to use regular real books, Legos, videos, field trips, etc. rather than planning a bunch of “curriculum” for them. Why learn in a contrived way when we can just…experience it for real? However, we do get some materials each year — mostly for ideas — from the Build Your Bundle Homeschool Sale. The materials are so affordable, usually $3 – $5 each (in bundles), that even if we just pick choose a few things, it’s worth it to us to have them available. What questions do you have about unschooling as kids get older? What are TedX talks? I looked it up on youtube but didn’t see anything relevanat?? I have struggled with my 8yo son trying to teach him to read, he never wants to. Thank you for your article, it really eases my worry about him being behind. I really appreciate your help as I really have no idea what I’m doing. I don’t want to push him but I want him to learn and not be behind. Thank you. Do you have any archived materials/articles on unschooling & standardized testing? Right now we live in a mandatory test state, but look like a mainly unschool family. We use the PASS test right now. THANKS! This simply isn’t unschooling…it’s child led learning. Someone looking for information on unschooling wouldn’t get accurate information from your post. There’s is a large community of people that would agree with child led learning and heartily disagree with unschooling. I think you are referring to radical unschooling, which is a more extreme form of it (that we don’t practice). There is a spectrum that is considered “unschooling” though. What is the difference between unschooling and homeschooling? This is more like Sudbury type homeschooling which is a lot different then true unschooling. My family does a mix. I prefer unschooling, but in America that is, unfortunately, nearly impossible. People, many panicking unschoolers, will all cave in some way. Americans love their Calvinism and Prussian education ideals. Coops are great, and as good as you are, probably, going to get. Most of my kids, though, have entered the school system by choice. Which is fine, and I think as good a compromise with unschooling as you can get…if they go that way on their own. One is only part timing high school. Forest schools would be cool. Are there any in the US? Yes, OR has the first ever forest based Kindergarten.